Crystal Clear Acrylic. The crystal clear cast acrylic is completely see-through and won't distract from your surfboard's graphics. Vertical Storage. 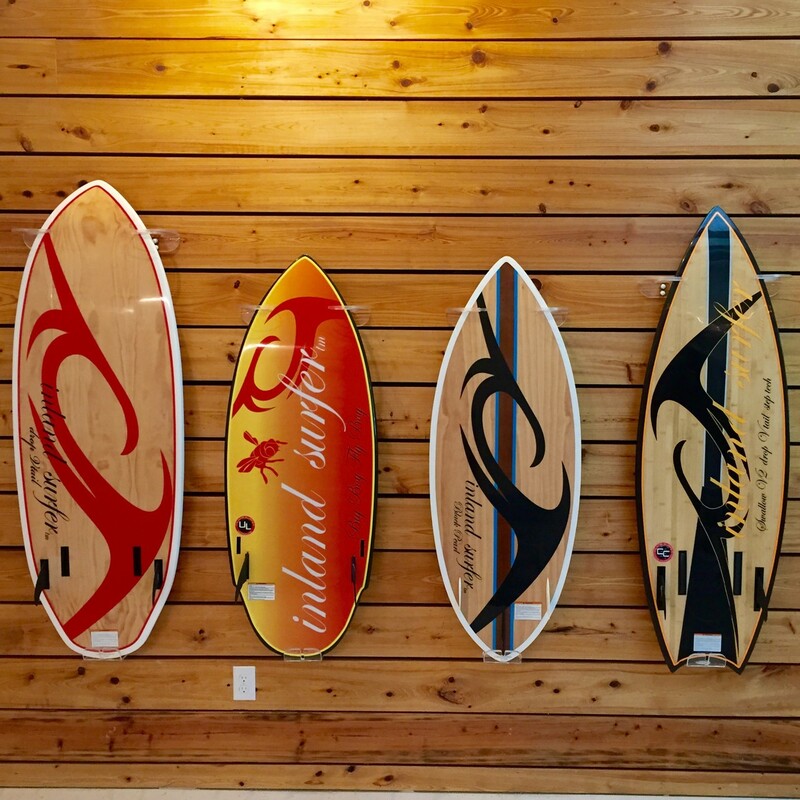 Since this rack holds your surfboard vertically, it doesn't take up much room on your wall, great for tight spaces like offices, living rooms, bedrooms, or man caves. 2 ways to store your surfboard in this rack. Without Fins. If your board doesn't have fins, then the top of your board can face towards the wall or away from it. With Fins. If your board has fins, then the fins will need to face out from the wall. We also offer a longboard version of this vertical rack, and a horizontal clear surf rack if you need to store your surfboard in a different direction. The product was great, however, the plastic wrap adhered to two of the three units purchased and the glue would not come off. 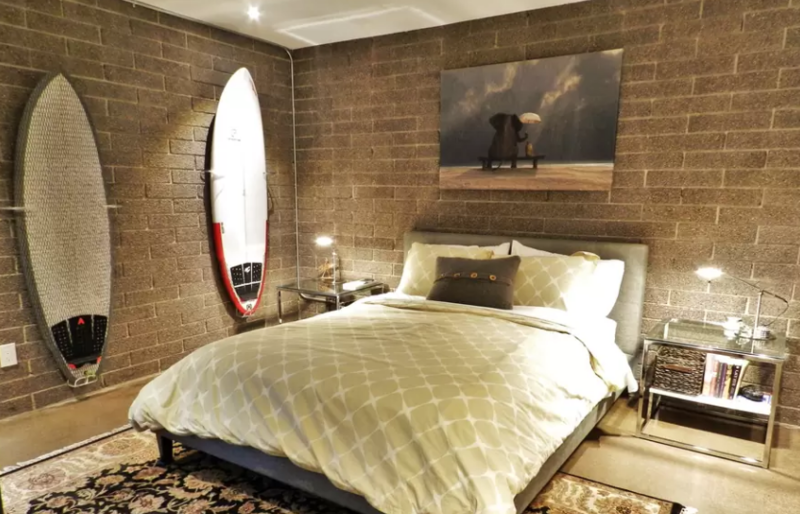 I did quite a bit of research (Not to mention, I also work in a shop with surf boards on display) to find the right device to mount my Wake Surf boards to my wall in my house. This is the best way I could find, and it looks great on the wall! 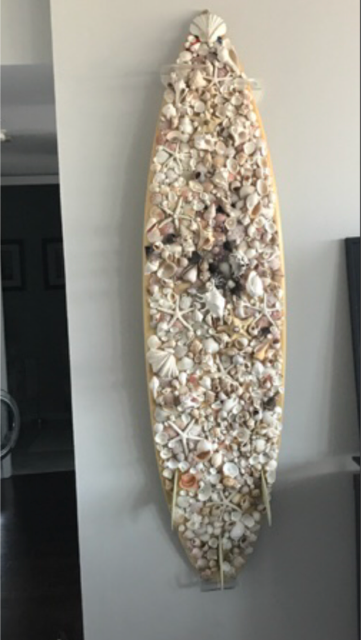 Perfect rack to display a board i scored from one of the pro surfers from the WSL! This mount did a great job of being minimal and was fairly easy to install. The only hiccup for us was that the hole cut out for the tail end was not actually a circle or machine cut. When we got the board up on the wall the upper mounts were off by an inch or so horizontally which was easy enough to fix - just surprised to see this detail not done accurately. The board that has been in hiding for years is now on display and looks great! Josh's workmanship is excellent! So original. He is able to customize to make it your own. Even during the busy Holiday rush he completed my order in under a week and delivered it to my home so my son would have it in time for Christmas! What service! I would recommend his product to everyone for a special and unique gift anyone would love! 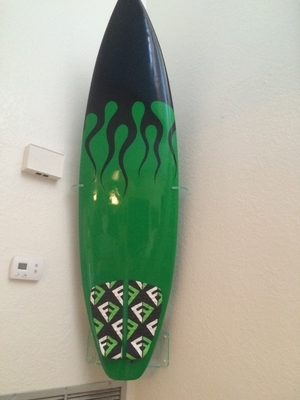 My board is actually a trophy from a car show and for display only so I needed something clean and high quality to hang my prized possession for all to see. This piece was perfect to do just that! Would highly recommend these acrylic wall mounts - they are sturdy and look awesome! Clean look and simple. Good quality and easy install. I needed to hang my board and purchased the acrylic mounts from storeyourboard. Proceeding and shipping was super fast. The mounts are better than advertised - well made, easy to use, keep the board snug. They work great. I have since purchased a mahogany mounting kit a second board and love that too. The surfboard mount was perfect.. the two shops here in Coronado had no idea.. They should sell them from your company!!! Purchased a signed board at a charity auction and wanted something to display the board that made it look good as it was. I certainly made the right choice with this mount. It looks brilliant! The mounts were awesome! 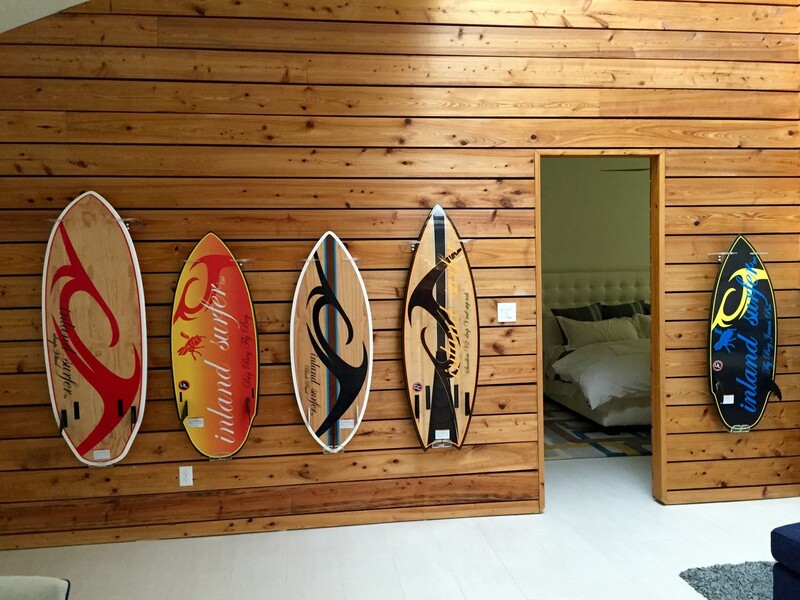 We used them to mount a few boards I shaped in Baja last year to decorate one of our AirBNB rentals. Fast shipping and the quality of the product is excellent. Easy to install. 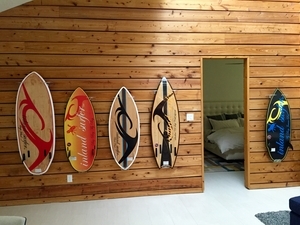 These hangers are exactly what we were looking for to hang our wakesurf boards! We were accumulating so many that they were cluttered so we decided to use them as decoration on a wooden wall that we have they turned out to be exactly what we wanted. We have to hang them backwards because of the fins on the wakesurf boards, they have big fins and a curve to the board. See the photos, love this product!! Is it easy to remove the board for use? With our vertical shortboard rack, to remove the board, you slide the nose of the board upwards until the bottom of the board is above the base, and then you can remove it. The top two fingers do hold the board safely in place, but you can remove the board this way. It may be tricky the first time you need to take the board off the rack, but otherwise is straightforward. Overall it is more of a display mount than one for a board in active use. Is their a way to lock down or put a screw in to keep board from being removed by guest? 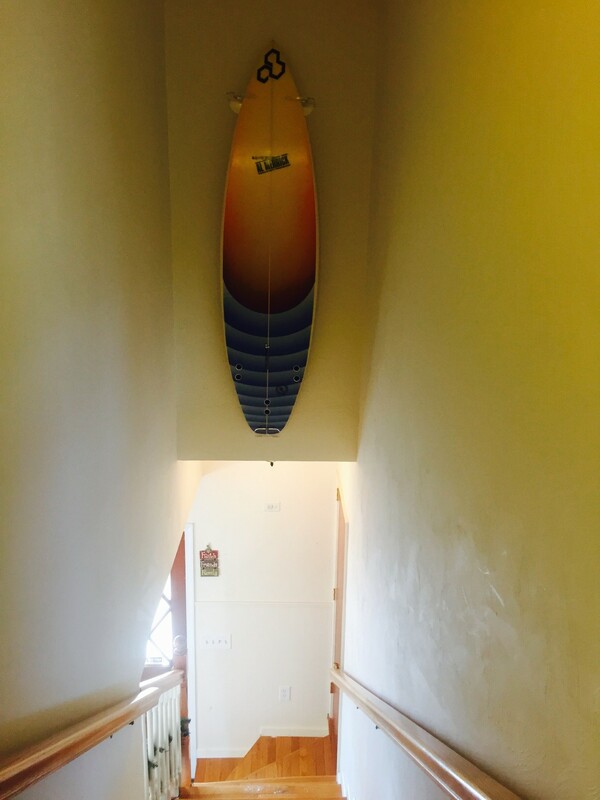 There really isn't an easy way to prevent someone from removing the board from this vertical surfboard wall rack - not without possibly damaging the board or the integrity of the wall mount, and the only surfboard locks we carry are ones that would detract from visually displaying the board as art, which this wall mount otherwise does nicely! I wish I had a suggestion for you for theft prevention, but I really don't for this particular rack that is meant to display the board. What is the projection of the brackets? Our vertical shortboard wall rack protrudes from the wall about 4.5 inches on the bottom piece; then the arm pieces that hold the board at the top project out about 5.5" from the wall. The rack can hold a board up to 3" thick. It works for boards without their fins, or you can have the fin facing away from the wall (into the room). Will this work to mount a board diagonal? 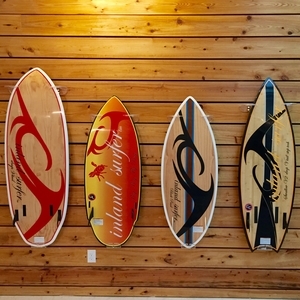 Our Vertical Surfboard Display Rack won't work for a diagonal set-up. It won't hold the tail of the board properly that way. You *might* be able to use this Clear Surfboard rack, https://www.storeyourboard.com/clear-acrylic-surfboard-wall-rack/, to hold a board at a very *slight* diagonal angle - the problem would be if you tried to angle the board too much, it could slide out -- I cannot guarantee it would work properly though, even at a slight angle. I want to hang a alaia but it has a fish tail so the the piece of acrylic that holds the tail of the board wouldn’t work for this. Do you have a recommendation that would? Actually, this flush vertical surfboard mount can work for some fishtails, depending on the width of their tails. It is one of the few vertical wall mounts that could possibly work for one, so would be one to consider... though depending on the shape of your particular board, we couldn't guarantee it would work well.